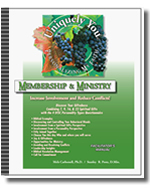 Teach all those who attend your church the importance of membership and ministry with the Membership and Ministry - Personalizing My Faith. Don't wait till 301 class to teach them about getting involved in the ministries of your church. They are more excited about getting involved when they first join than they will be later. Encourage all your members to find where they fit best in your church and teach them how to avoid and resolve conflicts once they get involved in order to keep them involved. Also, strengthen your program in order to keep it moving forward through these resources.